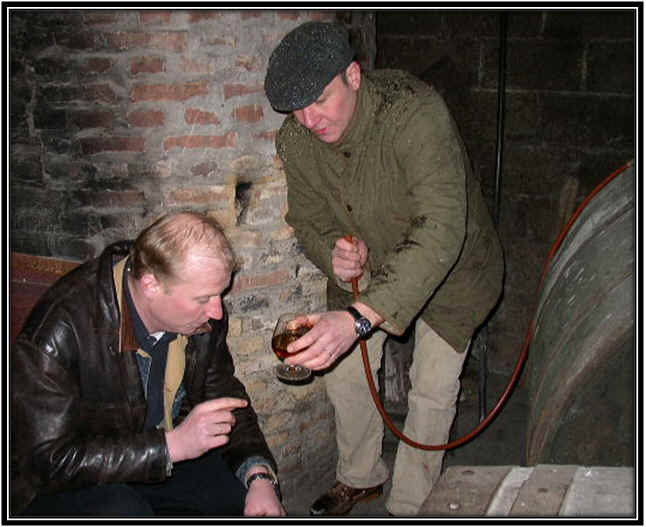 One of the best kept secrets in the world of elegant brandy is the spirit called Calvados. It comes from a region in France's Normandy with the same name. There are some really top distillers in the region and even your simple farmer down the street probably makes a bit of Calvados. The first references to "Calvados" as the name of some sort of distilled product dates back into the 1550s. 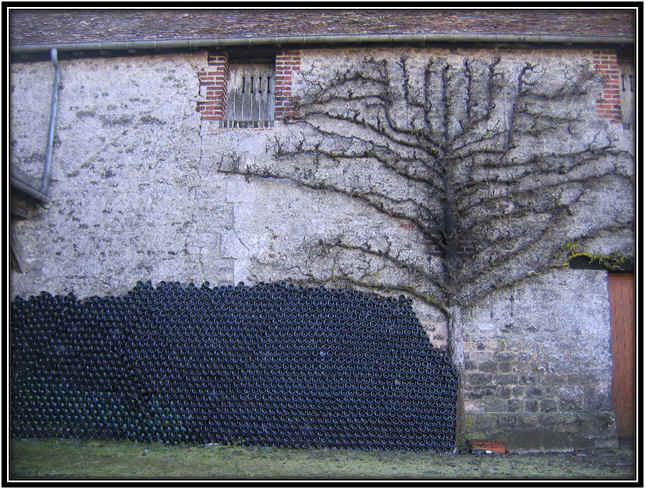 It took them until 1942, though, to grant "Calvados" its own Appellation Contr�ll�e status. I've read theories as to the origins of the name..."Calvador" being the name of a shipwrecked boat off the coast of Normandy is one suggestion. Another thought is the combination of the Latin "calvus" for naked or barren with the French word for spine, "dos." This line of thinking suggests the term was used by sailors for nautical landmarks along the relatively barren coastline. 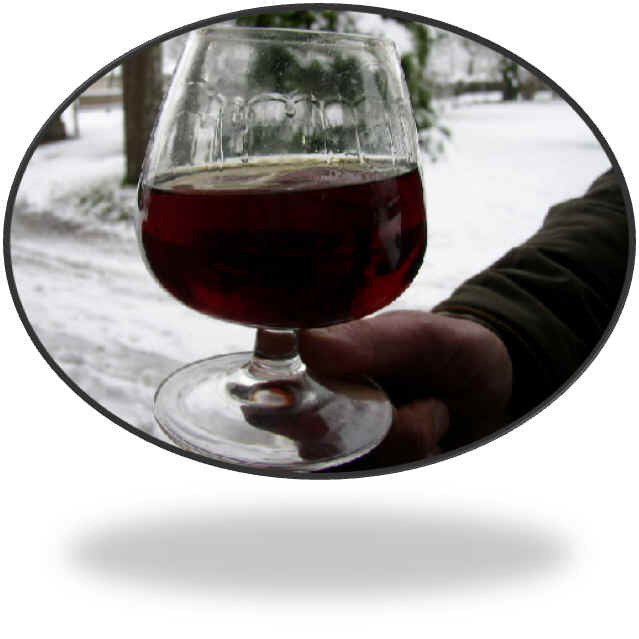 There are three designations of Calvados: "Calvados", "Calvados Pays d'Auge" and "Calvados Domfrontais" and their geographical areas of production are strictly defined by the Institut National des Appellations d'Origine (I.N.A.O.). 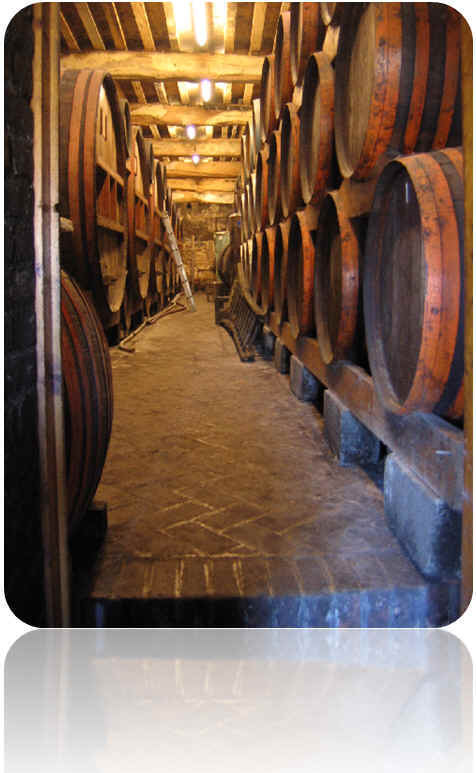 Basic Calvados comes from an apple distillate and it's made in a single distillation using a column still. 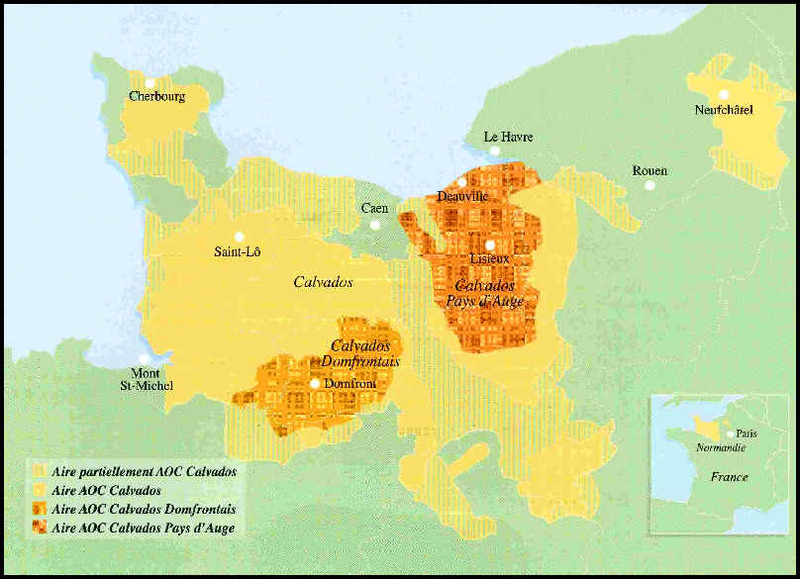 This appellation represents nearly three-quarters of the entire production of all Calvados. 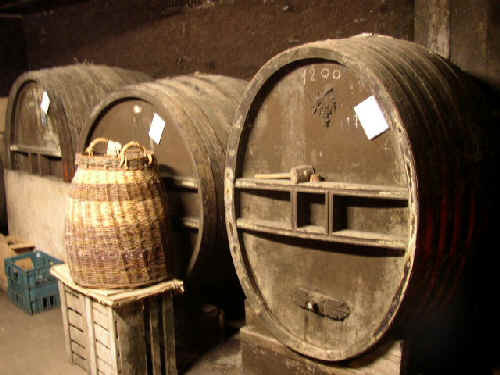 Calvados Pays d'Auge comes from clay soils, typically and these are usually double-distilled in "pot" stills. This designation, too, is typically entirely made of apples and it accounts for nearly a quarter of all Calvados. Most artisan distillers have numerous varieties of apples in their "recipe," citing some being superior for aromatics, others adding acidity and structure to the brandy, etc. Calvados Domfrontais hails from granitic soils and many of these orchards are predominantly pears. The law requires Domfrontais spirits to be at least 30% pears and there's even an age requirement to a percentage of the pear trees! Domfrontais Calvados is distilled once in a column still and it's a mere one percent of the entire Calvados production. Double distillation is said to produce subtle, elegant aromas and a roundness to the eau-de-vie. It's said these spirits age handsomely and are capable of maturing exceptionally over a 20-25 year period. The single, column still yields a more exuberantly fragrant spirit and these spirits, we're told, are superior for youthful, drink-it-young Calvados. The first apples of the year tend to ripen starting in September, but these are usually "eating" apples as opposed to those used for making cider and spirits. Then there are mid-season apples, ripening in October and November, with late season fruit being ready in December. These October-November-December varieties make the best cider and 'mash' for distilling. This means that the Calvados has matured for a minimum of 2 years in the wood. a minimum of 6 years' ageing. In the case of a blended Calvados, only the age of the youngest Calvados is indicated. 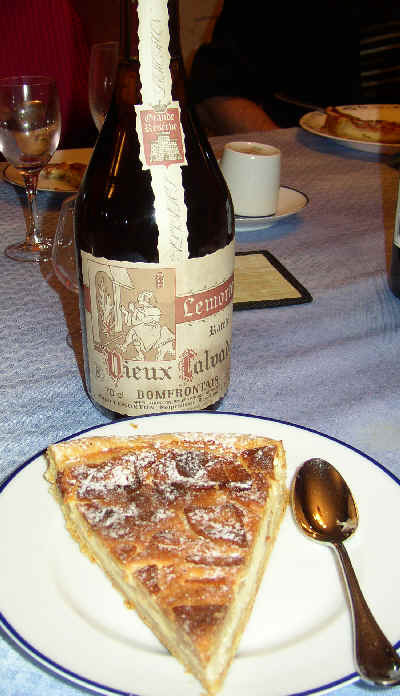 In France, you may enjoy a Trou Normand, a little shot of Calvados in between courses at dinner. This is said to aid digestion and provide help you make room for the next plate. We recently enjoyed this in the form of an apple cider sorbet doused with a splash of Calvados. Terribly civilized! 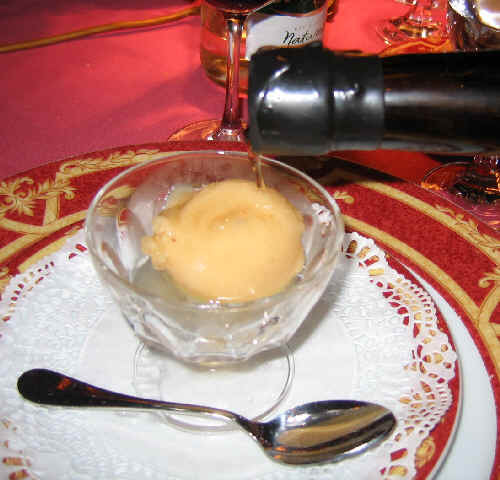 At the La Couronne restaurant in Rouen we had an apple sorbet topped with a pour of young Calvados from Adrien Camut. 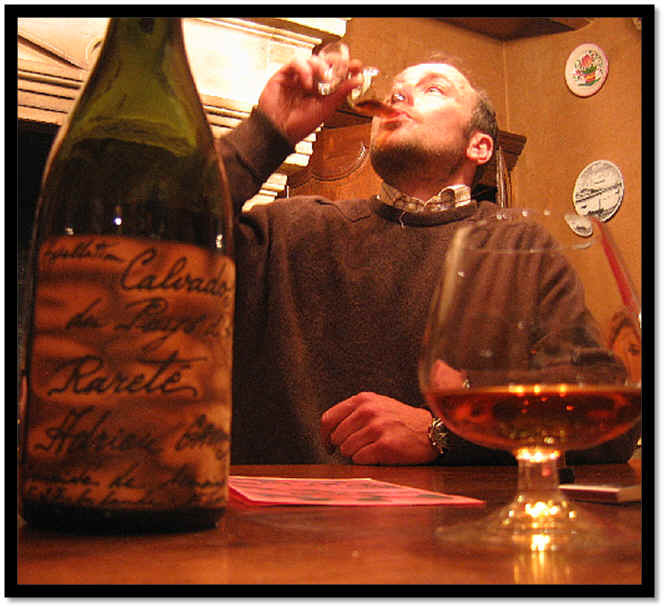 We also enjoy Calvados as a post prandial potation...it's a nice way to finish a meal and some older, well-aged Calvados can be exceptional. We have a nice range of Calvados in the shop...from good quality, entry-level Calvados to deluxe, serious quality, well-aged Calvados for contemplation. 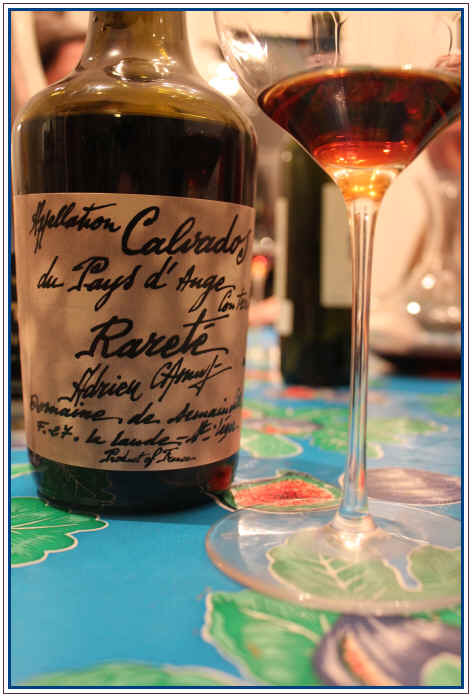 The sublime Calvados of the Camut family is found in top restaurants around France. Their work has been well-known in Europe and it's only relatively recently that we've had access to them here. 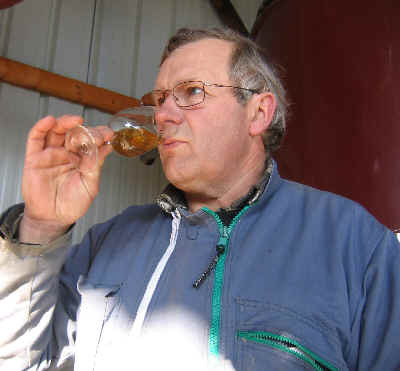 American importer Charles Neal had visited the estate on several occasions, working on cajoling Papa Camut to sell him some of their Calvados. This took some doing, since Camut would be obliged to use different sized bottles for shipments to America, not to mention jumping through hoops for labeling requirements as well as rigorous lab tests for the brandy. With their Calvados in demand in easier-to-accommodate markets, who needs the headache? But Charles finally got them to allocate some bottles to the U.S. and we've been featuring these ever since. Years ago we first visited the property. I sensed the Camut brothers, Jean Gabriel and Emmanuel, were pleasantly surprised to meet a few American customers who actually had discerning palates and an interest in their work. These fellows, for making such a well known and highly-regarded artisan brandy, are down-to-earth farmers and distillers. At some establishments, you meet the proprietors and they have a crew of folks working for them. As a result, they're a bit disconnected from the actual production of their wine or spirits. Not these guys. They know all about the intricate blend of two dozen, or so, varieties of apples. They know about making and aging the resulting cider and then distilling it in an old, wood-fired still. 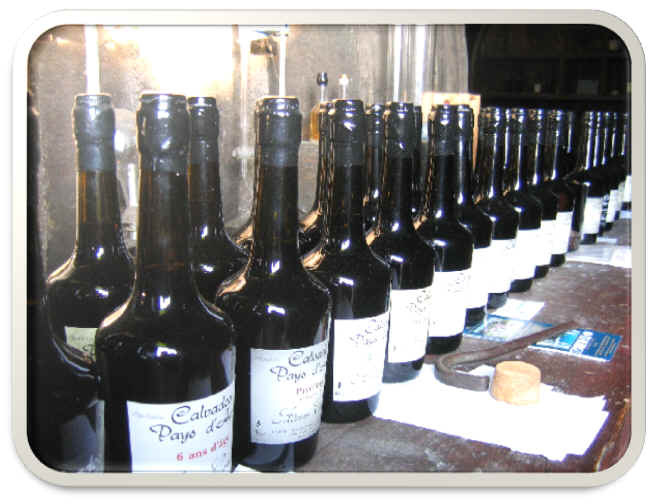 They know about aging the Calvados and they're involved in the bottling and hand-labeling each bottle. 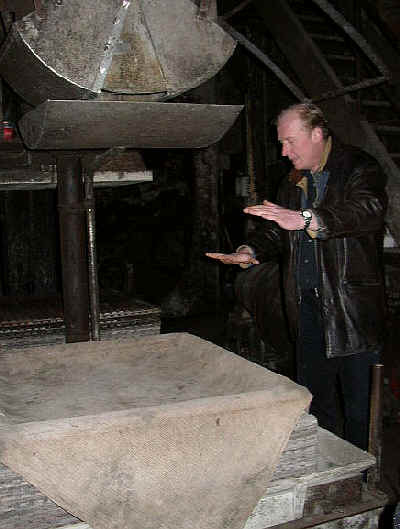 Jean Gabriel shows off their old press. 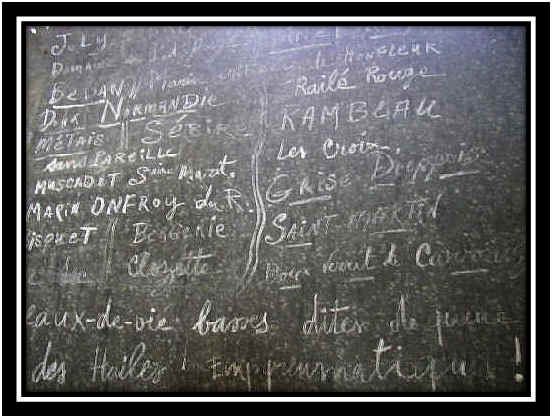 A chalkboard had the "recipe," a roster of the 25, or so, different apples which comprise their cider. Siphoning a taste of the cider, a work-in-progress. 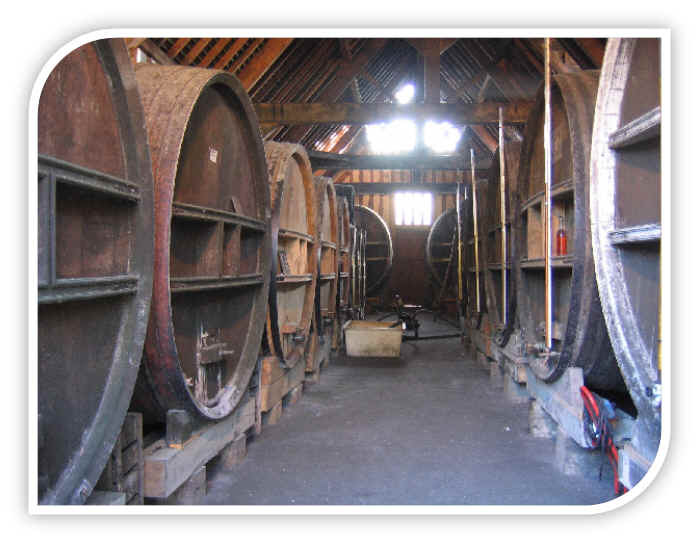 The cider is aged until September when they start distilling the apple "wine" from the previous year's harvest. The wood-fired still at Camut. 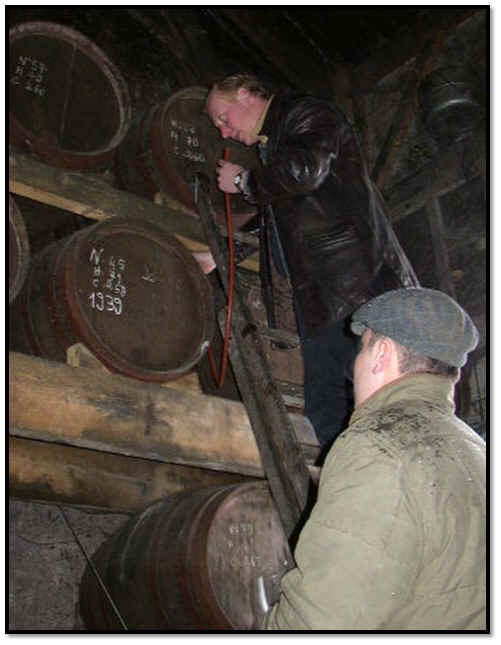 Jean-Gabriel and Emmanuel siphoning some Calvados from an old puncheon. "Rarete"...this bottle was brought out at 2 in the morning after a fancy dinner in the city of Rouen. We had parked the car, as directed by the Camut brothers, only to discover it had been towed by the police! We spent an hour to bail the vehicle out of the impound lot and then had a drive "home" where they immediately found some glasses and a bottle of this ancient Calvados. I think they sell but a handful of bottles annually. We typically have a few bottles of several Calvados in stock. The 6 year old has more fruity aromas and notes reminiscent a bit of Granny Smith apples. It's dry and nicely expressive as being "Calvados." There's a 12 year old bottling...this shows some baked apple character or apple pie-like fragrances. It's dry on the palate and shows a hint of brown spice. Nice length, too, as the finish lingers for a while. The 18 year is quite a "serious" bottle of brandy and a treat for the connoisseur. Its fragrances are reminiscent of a freshly-baked apple drizzled with honey and there's a faintly floral aspect to the fragrance. Impressive and long on the finish. There's a blend of old Calvados called "Reserve de Semainville." The young spirit in this blend is 25 years of age...and the older portion is, perhaps, 30 years of age. The perfume is wonderful and it's the sort of spirit that one swirls in the glass, savoring each little sniff. Again, there's some baked apple notes with a pastry crust element, a touch of brown spice and honey and yet it's dry on the palate and lengthy. 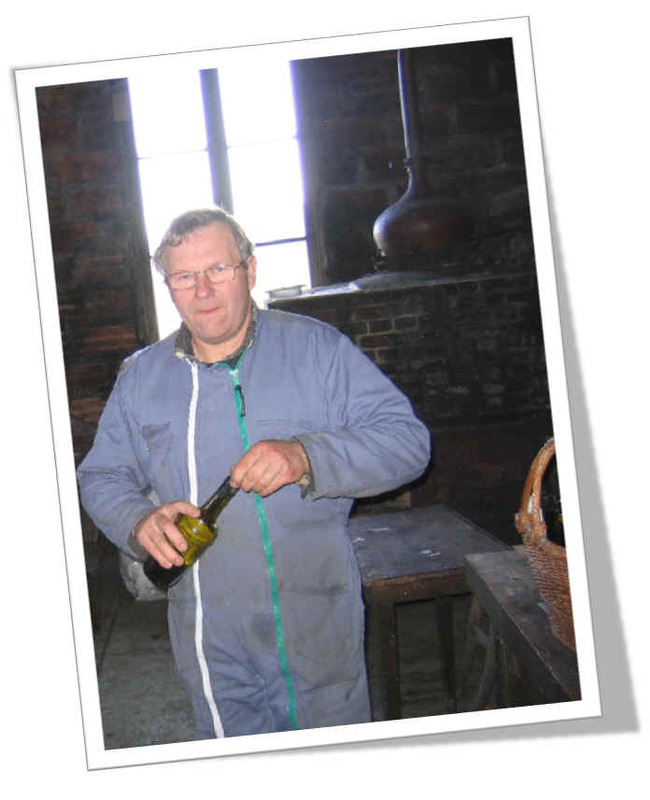 The 5th generation of the Groult family runs this modest Calvados company. The first distillations were made in the mid-1800s, but brandy was a small sideline to their livestock business. The second generation installed a second still and increased the production. Roger Groult added the company's third still in 1950 and it was he who really pushed the production in terms of quality (and quality), adding significant cooperage for aging the brandy. In 2008, the new generation has assumed the reigns of this company, as young Jean-Roger has taken over the firm. They have 30 hectares of orchards and they augment their own "estate grown" fruit with that of some neighbors. Bedan, Clos Renaud, Doux Verret de Carrouges, No�l des Champs, Rouge Duret. They bring sugar and balance out the bitterness. Antoinette, Fr�quin Rouge, Marie Mesnard. They are rich in tannins, lend the cider its colour, body, finish and keeping qualities. Bisquet, Domaine, Egyptia, Germaine, Mettais, Moulin � Vent, Petite Sorte, St Martin. Those apples typical from the Pays d�Auge combine the qualities of sweet and bitter apples. They bring a fresh taste on the palate. 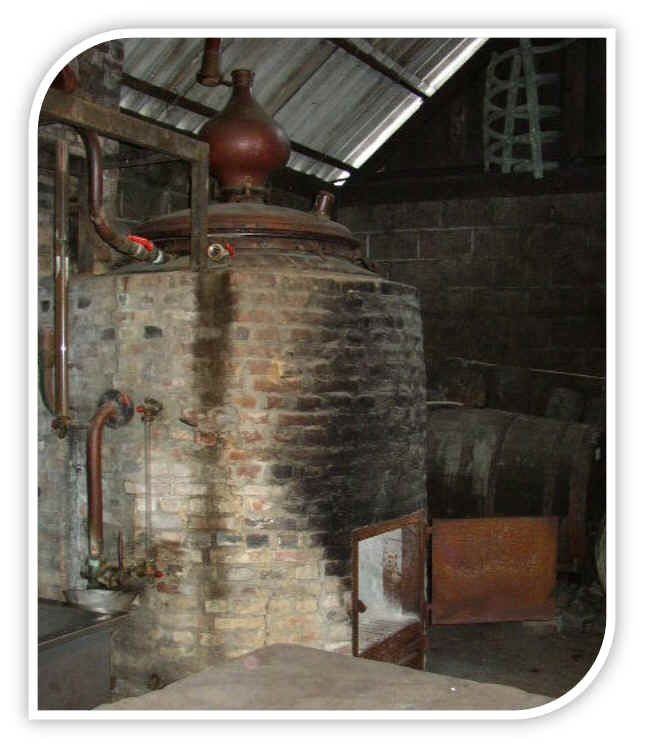 As with the Camut family, the Groult clan uses wood-fired stills for their brandy. I don't think, though, that they age the cider quite a long as do the Camut brothers. The 8 year old from Groult retains a beautiful perfume of the fruit. It's easy to spot as "apple brandy." And it's smooth and rather complex for a young sipping Calvados. There's a 15 year bottling, as well. There's less overt fruitiness here and more "nutty" notes associated with well-aged brandies. The flavors are fairly soft and supple on the palate. 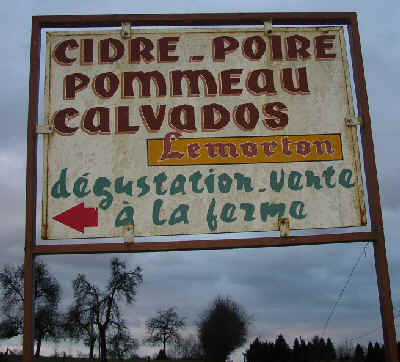 The Lemorton family is in the "Domfrontais" region of Calvados and with more granitic soils, pear trees are more predominant. The production is small and in a certain way, it mirrors, a bit, the production of the Camut brothers. 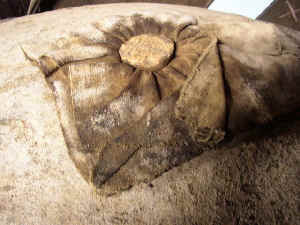 The cider is aged until shortly before the succeeding harvest when it is then distilled. They have a smallish alembic still and the spirit starts out around 140 proof before they knock it down to something more drinkable. The wood cooperage employed is old and neutral, so you'll really get a nice sniff of the fruit aromas. The "Reserve" bottling is the youngest we see...nice fruit on the nose and a hint of wood spice, but it's very faint. The spirit is dry and there's a mild "attack" here (in a positive way), with the eau-de-vie being a good palate cleanser and digestif. We have a 1984 vintage...not that the "vintage" is important, but the age of the spirit IS. This has a beautiful fragrance, showing some pear nectar aromas. It's dry and smooth on the palate, apart from the 'fiery' notes of the alclohol. The 1978 is phenomenal. It's aged "to perfection." The aromas are sweet, but not sugary. The flavors are deep and complex. It's quite smooth and this is tops. No question. This modest estate is owned by the Giard family and they've been around for more than just a few years. 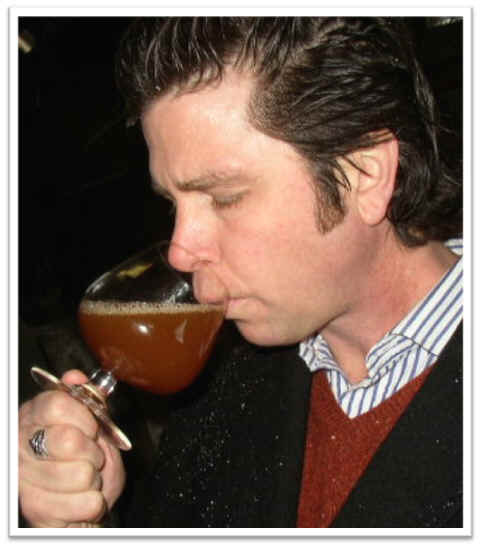 Patrice Giard is the current "master of the Manoir," making good ciders and Calvados. The current bottling of Reserve is a blend of barrels from 1999, 2000 and 2001 as we understand it. It's got nice appley fruit aromas and flavors...not as complex as the older bottlings we're fond of (above), but it's a good, youthful spirit and well-priced for this quality. I also found their cider to be quite good, with intense fragrances of the fruit...we usually have that available in the shop, too, priced around $12 a bottle. The Laird family came to the New World in 1698 according to their record books. One of the Laird sons, it's speculated, was involved in the distillation business back home in their native Scotland. Upon their arrival on America's eastern seaboard, they began distilling apples, as these were plentiful. Another family member establish a small inn during the 1700s and there are documents showing "cyder spirits" on the menu, costing what was then roughly half a day's pay. One Laird was in the army under a fellow named George Washington and he was instrumental, apparently, in supply "applejack" to the troops. 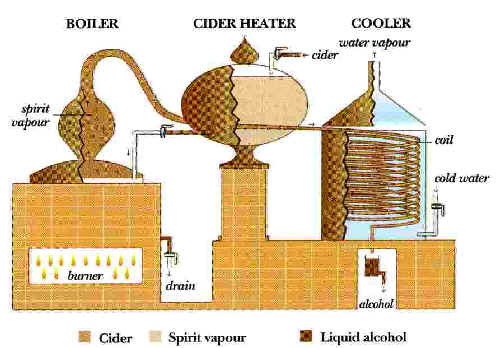 Washington reportedly asked the family for the recipe so he could do some "cyder spirit" production of his own. The Laird family still owns this company, headquartered in New Jersey but with a distillery in Virginia. Fruit for their "Applejack" comes from the Shenandoah Valley. Applejack is different from Calvados. It's 35% apple brandy blended with some neutral spirit. It's the spirit for the cocktail called a "Jack Rose," (3 parts Applejack, 2 parts lemon or lime juice and a few drops of Grenadine...shaken with ice and poured in a highball glass or martini glass...garnished with a Maraschino cherry). Laird's does make a full-throttle apple brandy, though. It's a 12 year old spirit, barrel aged and bottled in small quantities. That's "too good" for a Jack Rose cocktail. BACK TO THE PREVIOUS PAGE...GRAPPA!